The Dangerz are a clever couple who recently abandoned the "normal" life and hit the road in a sweet, retrofitted 1967 Volkswagen van! Their souped-up VW is outfitted with eco-friendly finishes and topped with a solar system that provides power wherever their journey may take them. So where have they traveled in this magnificent compact home-on-wheels? The Dangerz, accompanied by their faithful dog, Karma, set out down the Pan-American Highway -- a system of roads and freeways that extends from Prudhoe Bay, Alaska, in North America to the lower reaches of South America. Little known fact: in 2010 my partner and I got rid of almost everything we owned, loaded the rest up into a 26′ RV, and set off across American in search of adventure. In retrospect, we weren’t really prepared for life on the road, and about four months later we were ready to return to civilization. The first of many bad decisions was the idea to travel in such a big vehicle. Twenty-six feet might not seem like much, but when it’s your only mode of transportation and gas is $3.50 a gallon, moving becomes painful. Our slapstick scheme pales in comparison to the brilliant journey of “the Dangerz“, however. First off, no their last name isn’t really Danger. Apparently friends started the moniker as a joke, but it eventually stuck, and for two people willing to trade a home and jobs for the inside of a VW van, it’s kind of appropriate! They officially hit the road in July 2012, but they journey began long before that. In order to live (somewhat) comfortably on the road, the camper, dubbed ‘E’, had to be completely refurbished. The Dangerz started by pulling out the wet, rotten and moldy foam and shag that was on every inch of the bus. This huge task revealed a sticky yellow glue residue that had to be removed as well (and proved even nastier). Having all of that ick out of the bus was much better for breathing, but hard on the ears. The empty van was basically a tin can on wheels. They installed a layer of foil-backed butyl (RAAM’s BXTII) on almost every surface to reduce vibration and provide the perfect thump testing grounds, and then covered that with closed cell foam (ensolite) to stop ambient noise bouncing around inside the bus. Then it was time to imagine an interior that could double as a home while on the road. The Dangerz eventually decided on a variation of the traditional “Westy” van interior design, and set about installing the needed bed, seats, cabinets and kitchen equipment themselves. A few months later, they had a popup table attached to the rear cargo door; perfect for holding the tunes and happy hour beverage of choice. To the right is the propane cooktop with kitchen storage above and a space for a water tank below. The fridge lives on the left, right next to the lounge/couch that has spare tire storage underneath. The slats that make up the couch pull out to form the bed. At the front the slats simply latch onto the cooktop cabinet. By the fridge, the two low cabinet doors open to form a base for the bed. No, the material on the cabinet doors and fridge face isn’t bamboo. It’s Kirei, another eco-material, made of 100 percent recycled sorghum root. “We found it absolutely beautiful and thought the contrast and texture were perfect for the camper,” write the Dangerz. Want to live vicariously through the Dangerz? 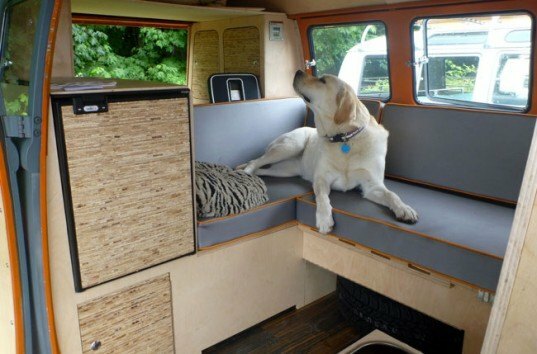 You can follow them on Facebook or read more detailed van-remodeling stories on their blog. Very cool and classic micro-bus project. Too bad the propulsion isn't solar powered. Those old air cooled VW engines weren't the cleanest. The couple officially hit the road in July 2012, but they journey began long before that. In order to live (somewhat) comfortably on the road, the camper, dubbed 'E', had to be completely refurbished. The Dangerz started by pulling out the wet, rotten and moldy foam and shag that was on every inch of the bus. This huge task merely revealed a sticky yellow glue residue that had to be removed as well (and proved even nastier). Having all of that ick out of the bus was much better for breathing, but hard on the ears. The empty van was basically a tin can on wheels. They installed a layer of foil-backed butyl (RAAM’s BXTII) on almost every surface to reduce vibration and provide the perfect thump testing grounds, and then covered that with closed cell foam (ensolite) to stop ambient noise bouncing around inside the bus. Then it was time to imagine an interior that could double as a home while on the road. The Dangerz eventually decided on a variation of the traditional "Westy" van interior design, and set about installing the needed bed, seats, cabinets and kitchen equipment themselves. A few months later, they had a popup table attached to the rear cargo door; perfect for holding the tunes and happy hour beverage of choice. To the right is the propane cooktop with kitchen storage above and a space for a water tank below. The fridge lives on the left, right next to the lounge/couch that has spare tire storage underneath. The slats that make up the couch pull out to form the bed. At the front the slats simply latch onto the cooktop cabinet. By the fridge, the two low cabinet doors open to form a base for the bed. No, the material on the cabinet doors and fridge face isn't bamboo. It’s Kirei, another eco-material, made of 100 percent recycled sorghum root. "We found it absolutely beautiful and thought the contrast and texture were perfect for the camper," write the Dangerz. Because they wanted to stay off the beaten path as much as possible, the Dangerz also decided they needed a way to have at least some power even when posted up in remote areas. 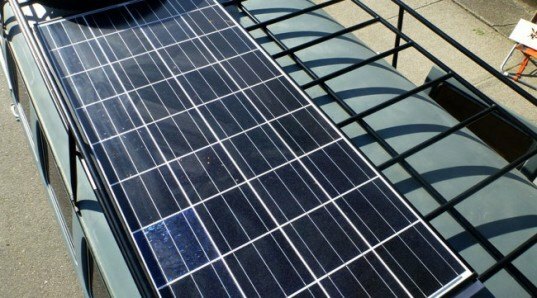 They installed a Kyocera 135W solar panel on the van's roof, and use it to power two 12 volt batteries that are stored under the van's seats. "For the solar controller we went with a Sunsaver Duo, which seems to be the controller of choice with the added bonus of being very affordable and easy to use," explain the couple. "The handy panel tells us how much energy we are pulling off the sun, how much we are drawing at any given time and how much power we have left to draw. We also hooked everything up to the starter battery so that we can track its power level and recharge it from the sun as needed. An isolator ensures that the starter battery wont draw down and leave us stranded simply because we stay up late and leave the lights on like motel 6." So where have they traveled in this magnificent compact home-on-wheels? They certainly didn't waste their time in predictable-old America like we did. The Dangerz, accompanied by their faithful dog, Karma, set out down the Pan-American Highway--a system of roads and freeways that extends from Prudhoe Bay, Alaska, in North America to the lower reaches of South America. 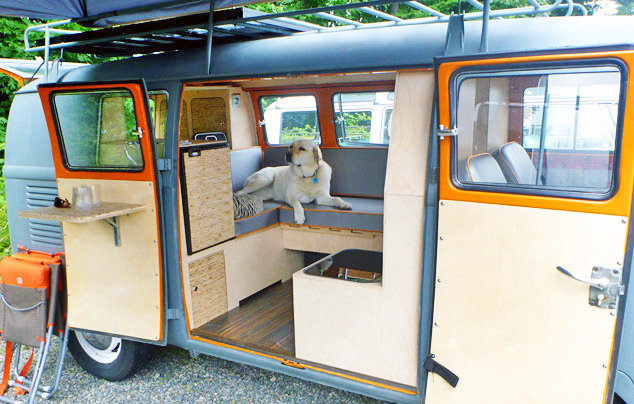 You can follow them on Facebook or read more detailed van-remodeling stories on their blog.